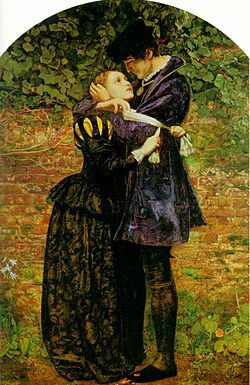 “A Huguenot, on St. Bartholomew’s Day, Refusing to Shield Himself from Danger by Wearing the Roman Catholic Badge”, an 1852 painting by John Everett Millais. Pierre Monnet is the 19th great-grandfather of Richard, James, Gary, Lisa, Carl, Jane, Bruce, Cathy, Ron, Stacey, Matt, Sandy, and the 20th great-grandfather of Asher, Owen, Caitlyn, Becky, Emily, Jack, Jill, Jordan, Mike, Brian. The Marquis Pierre Monnet was born into the noble House of de Monet de la Marcque in Poitou, France, in 1523. There is some evidence that his parents may have been Abraham Monnet and Susanne Chastain. The Monnets and Chastains were Huguenot (Calvinist Lutheran) families. Pierre married Marie Guillamart in 1545. They had at least nine children. In 1570 Pierre was given a grant of Coat of Arms. France in the 16th century was in a period of political and religious upheaval. The premature death, following a jousting accident, of King Henri II in 1559 created a protracted political crisis. His sons who succeeded him in turn – Francis II (1559-60), Charles IX (1560-74), and Henri III (1574-89) – were young and weak, subject to their ambitious mother Catherine de Médicis, and vulnerable to manipulation by powerful noble factions. The explosive growth of Protestantism in France only exacerbated this dangerous political situation. The new Protestant faith was becoming a well-defined force in the kingdom and had attracted to its support the best citizenship of France. 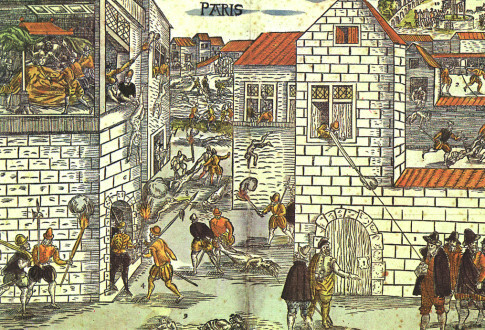 By 1562, there were perhaps two million Protestants and nearly 1,250 Reformed churches in France, flourishing despite repeated royal censures and harsh persecution. In August 1572, Charles IX’s sister Margaret was married to the Protestant Henry III of Navarre (the future Henry IV of France). This marriage was an occasion for which many of the most wealthy and prominent Huguenots, including Pierre Monnet and his family, had gathered in largely Catholic Paris. Four days after the wedding, on August 23, 1572 (the eve of the feast of Bartholomew the Apostle), and two days after an attempted assassination of Admiral Gaspard de Coligny, the military and political leader of the Huguenots, the king (or, as contemporary rumor had it, his savagely anti-Protestant mother) ordered the killing of a group of Huguenot leaders, including Coligny, which led to a popular uprising against French Protestants. The slaughter, beginning at dawn on August 24, spread throughout Paris and expanded outward over the following weeks across France. Modern estimates for the number of dead vary widely, from 5,000 to 30,000. Pierre, Marie and nine of their children were among those massacred in Paris on St. Bartholomew’s Day. Fortunately for us, Pierre’s eldest son Pierre, also slaughtered on that day, had a young son, Abraham (our ancestor), who survived.